Both an excess and a lack - or an abnormal distribution - of our body fat mass is associated with serious metabolic and cardiovascular disease. The capacity of fat cells, adipocytes, to communicate with other organ systems via the secretion of numerous lipid and peptide factors called ‘adipokines’ accounts for this pathophysiological link. It is only recently that we have learnt of the important role of adipocyte function in regulating several vital organ systems. 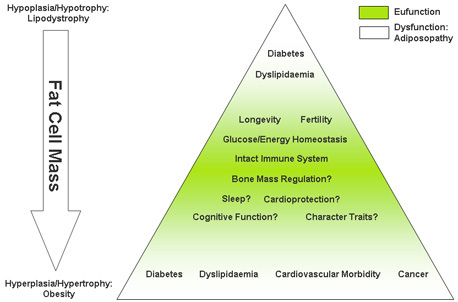 There are close molecular ties between the control of energy balance and fertility, immune system function, and aging. Our research group proposes a model of adipose tissue as a ‘critical link organ’ that enables the direct coupling of energy balance control with endocrine-immune regulatory circuits which are critical for survival. Adipokines are important messengers to secure multi-system integrity including fertility and bone mass density. In accordance with this concept, we hypothesise further that fat cell factors may also regulate sleep, muscle bulk, as well as learning and cognitive abilities, to name only a few examples. Our current research focus lies on the investigation of molecular mechanisms controlling metabolic and endocrine fat cell function. The analysis of these mechanisms may lead to the development of new therapies for diabetes, obesity, and hypertension. Furthermore, it may also help to identify new options to treat various other endocrine-immune diseases including infertility, osteoporosis, and accelerated aging.